1. Preheat oven to 425 ˚F (220 ˚C). 2. Place chickpeas, onion, garlic, parsley, cilantro, cumin, salt, and chili flakes in bowl of food processor and pulse until combined but still chunky. 3. Add flour and baking powder and pulse until it turns into soft mixture that you can roll into balls without sticking to your hands. 5. Roll dough into meatball-sized balls and gently flatten each into little patty. 6. Place patties on heavy-rimmed baking sheet, preferably one that's dark in color. 7. Brush each patty with canola oil, flip them over and brush other side. 8. Roast for 15 minutes, then flip them over and roast for another 10 minutes, until crisp and golden on both sides. 9. 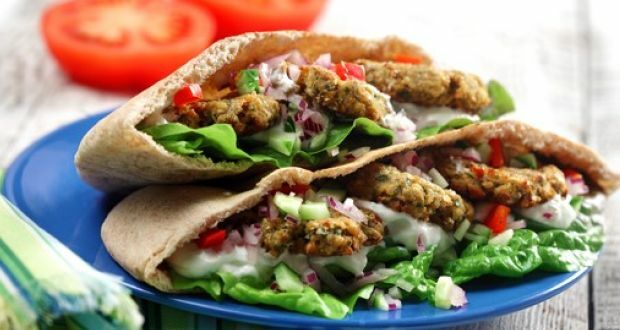 Serve warm, wrapped in pitas, with tzatziki, chopped cucumber, tomatoes and red onion.